I stumbled across this book at the library. 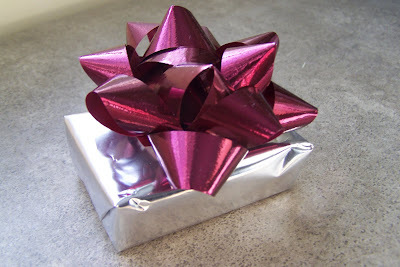 It is full of lovely ideas on creative ways to wrap gifts. As you know, partly due to my laziness and partly due to my frugality, I rarely have lovely wrapping paper in the house. The author does a great job of presenting his ideas. So much so, that I was inspired to try some this past Christmas. Brilliant! 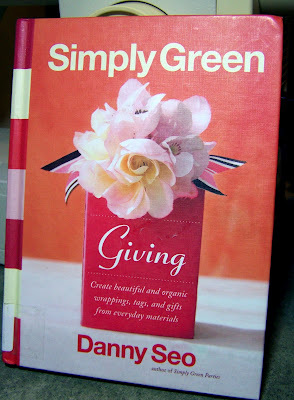 I’ve seen another version of that book… I think it was pertaining to parties (Simply Green: Entertaining). Great ideas! I love the Doritos bag idea… so clever. This is right up our alley! It’s PEAR-fect! Wow, the potato chip bags look great as wrapping paper. What a neat idea.